FLYING MACHINES- most ADC machines are available in a "Flying"configuration. Flying machines are designed to be attached above and to the curtain track. The machine must be located a minimum 10' from the live-end pulley. 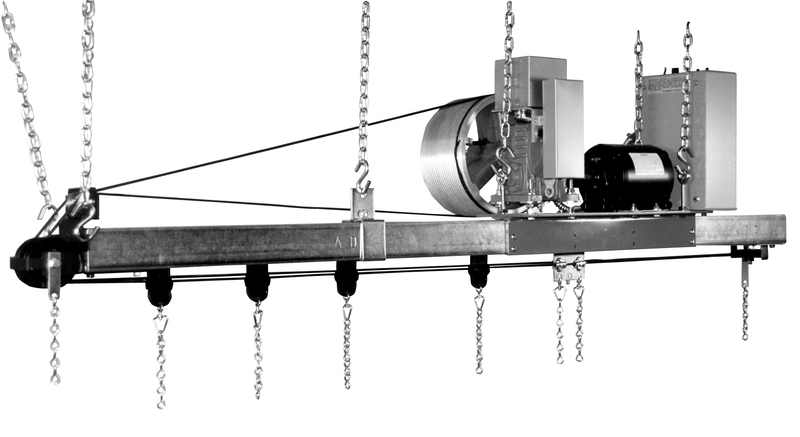 A special optional "Flying" live-end pulley must be used on the track to route the operating cables up and then parallel with the curtain track. The machines must be supported by overhead structural members, the machines attach to the curtain tracks for cord alignment only. Machine must be specified as "Flying Type" at time of order. Note that if you use a flying machine, you will need to use a "Flying Live-End" pulley to route the operating cables up and over the track. Flying Live-End pulleys are available for all ADC track systems in both standard (track not pipe mounted) as well as pipe mounted configurations.